I suppose it cannot be called a tradition if it’s only the second time I am doing it, but on New Year’s day I planted some more garlic in the greenhouse. Last year I found some nearly-sprouty cloves and said “the hell with it” and threw them in an unused greenhouse bed without really thinking much about the consequences. They ended up being gigantic. Seriously huge, apple-sized bulbs. All garlic is now getting the greenhouse treatment. My one honest garden tradition that I have is that I like working in the greenhouses (or garden, weather permitting) on each and every holiday. Solstice came cold and blowy and I turned the compost piles. Christmas, though frozen, was a greenhouse weeding day! Thanksgiving was a seed-planting day. And New Year’s found me with a trowel in my hand. Considering how much these gardens do for us, this tiny bit of cultivating is my way of saying thanks, of reconnecting a tiny bit with this good earth. Then I grab what I can for a feast!! This entry was posted in greenhouses, sweat. Bookmark the permalink. Hardy garlic is a sign of hope in the winter, I think. Wow, those are huge. Working in the gardens/greenhouses on holidays is a wonderful tradition and a sure way to feel a connection of thankfulness. Can garlic be started inside? Or does it have to go straight into the ground? I ask because I don’t have a greenhouse or cold-frame available but would like to start garlic…. Great looking garlic! We ordered 8 different types of garlic this year from Seed Savers Exchange and planted it in late November out in the garden patch. I hope it will do better than last year’s batch. Last year’s had to be moved from the garden of our previous home, and then moved again part way through the season, so it got a bit stunted. Hey, that’s a great idea… How early do they yield a bulb this way? I am constantly impressed by your farm. But I giggle at the, um, raggedyness of your soil. I always groom my dirt to yuppie perfection, like a can of Folger’s. Waste of time, I guess! You left out the wonderful and therapeutic smell of a greenhouse. Especially in winter when snow or rain can monopolize the smell of the outdoors, it must be wonderful to spend time in a place where you smell good earth. Your garlic is lovely. I’m glad you pictured it. I planted some bulbs outside (Zone 9) late in the fall and they’re already sprouting. Can’t ever have too much garlic! Oh, yeah, I should also have said that I grew some garlic last year for the first time ever. I had no idea what to expect (never having grown or even eaten garlic before). 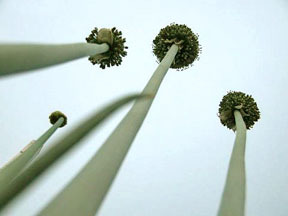 I was astounded to see the scapes grow to 5-6 feet and coiled 2 or 3 times. We now have a bunch of garlics to use, but slowly as we learn what to do with them. So I enjoyed your post on the amazing garlics. I was just thinking that I forgot to plant my garlic in the fall..gasp!! But although I do not have the greenhouse yet, I think if I placed a row cover over them they’d do fine…yes? Worth a try. Hiya MC: Yeah I think garlic needs to be planted outside; they appreciate the cold as it activates the plant to up and sprout out. You might say well heck my garlic ups and sprouts in the pantry too and that IS true but, like most of the onion family, the plant is daylight sensitive. You can plant it outside under 4″ of dirt with the pointy end up. Or you can gang a bunch of small cloves together and harvest the greens: sometimes if the cloves are really small they just don’t have the energy to produce a large bulb. Claire, hi. Yeah I will bet the garlic didn’t appreciate its new home as much as you did. I tend to keep the larger bulbs for seed garlic and plant them out in the greenhouses in November, or Oct. outside in the garden (if I still had garlic in the garden that is). But your new cloves will probably produce really well for you. That does sound like a lot of garlic (a good thing)! Well, Mark, I figured I would have to harvest them later, especially since the outdoor ones had two months on them (planted in Oct as opposed to Jan) but nope. They were ready about the same time, but I harvested them later (early July for outdoor, later for indoor). I guess the relative warmth of the greenhouse kept them growing and not in limbo like the outdoor ones. CC, hah! I suppose that does look mighty raggedy. See the thing is I don’t want to see the soil at all outside, so it’s mulched deeply: this brings the worms to the surface to aerate the clay. Indoors, it’s still mostly that awful clay soil so I need to lighten it up with compost and lots of dried grass clippings to ensure the stuff stays fluffy. So maybe we both spend the same amount of time dithering while achieving different visual aesthetics? WS, yeah! There definitely is that appeal of the funk of the greenhouse. They are definitely dens of humusy rot and I adore that fine stink, especially since the rest of my world is Mr. Clean white. But yes I only have four beds of garlic planted and it’s making me a bit paranoid: looking at my stash here and wondering, dare I plant more? Kathy, I am sure there’s still time (if you hurry)! You could do a rowcover but what would be even better would be a deep mulch of chopped leaves or leaves/grass. They probably won’t do much initially. I think we’re supposed to plant them in Oct. so they DO sprout and then kind of go into limbo for a while until spring. (In this greenhouse I just bypass the limbo time.) Just don’t forget!! It’s tremendous that you appreciate gardening as a celebration, not just a task. Great to see you 3 doing well. Wish you a wonderful 2009! Can one plant the garlic cloves outside (if I can dig the ground that is)? What is the temp difference between your greenhouse and outside on a cold winter’s night? My greenhouse usually ends up being the same temp inside as outside, which seems odd to me. Hi Emily: the nighttime difference in mine is anywhere between 10-20*. When did you get yours erected, was the ground cold for any part of that time? I do have a lot of surface area to heat up (and hold the heat) under the canopy of the greenhouses so that might have something to do with how warm they stay. I do double coverage too with agricultural cloth, over raised beds, both of which keep the plants just a little bit warmer. On the coldest day we’ve had here (1* overnight) this year the greenhouse got down to 18*. I know you’re in AA but that other state school 😉 has a climate website that I find quite helpful. I have an ag station near my house that records all temps and wind and solar radiation per day: helpful info if you like to geek out on stuff like this like I do. Also…I’m totally planting garlic this weekend. 🙂 If you’re so inspired, I’d love to hear what you plant, when…it’s surprisingly hard info to find.